Panel of clear and coloured glass with painted and stained details. 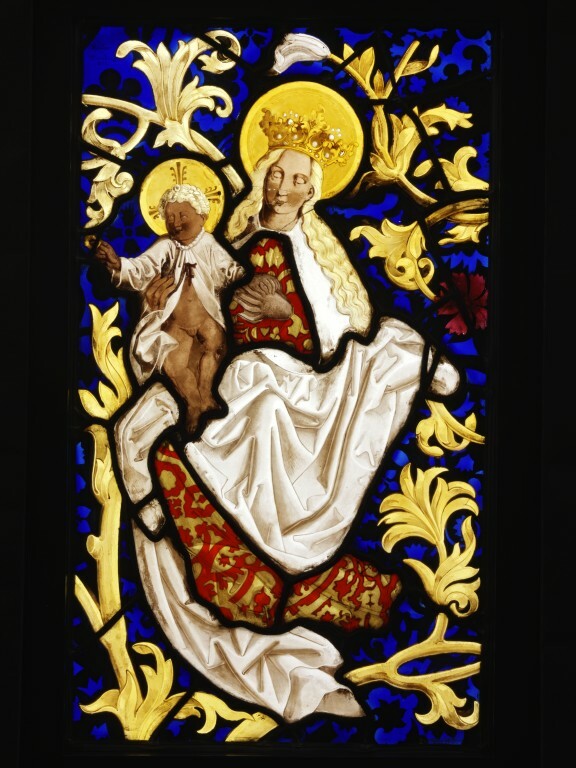 This stained-glass panel depicting the Virgin and Child has a companion panel (Museum number: 2634-1845) that portrays St Catherine. Together they form the subject of the Mystic Marriage of St Catherine. Here, the Christ Child reaches out with his right hand and offers a golden ring. In the companion panel, St Catherine reaches out to take it. According to medieval legends, Catherine was born to a noble family in Alexandria at the end of the 3rd century. She was converted to Christianity, probably in her teens, and underwent a 'marriage' or a spiritual bond with Christ. The Golden Legend, a compilation of saints' lives written about 1260, relates that Catherine refused the attentions of the pagan emperor Maxentius, who had her tortured, including breaking her on the wheel. She was martyred in the early 4th century. We believe that the panels were made about 1845 by the studio of Stephen Kellner in Nuremberg, Germany. The design is an exact copy of part of a 15th-century window in St Lawrence's church in the city which had been commissioned to commemorate the Volckamer family. This vividly coloured panel is made from both flashed and painted glass. The red glass has been acid-etched in some areas, and the clear areas where the flash was removed have been painted with silver stain, which turns yellow once fired. In this instance, the cobalt blue was achieved by applying blue enamel to the reverse of clear glass. Its peculiar surface finish suggests that it was applied not with a brush but with some type of roller, a technique unusual to stained-glass production. An identical panel was exhibited by Kellner in the Great Exhibition of 1851. This version was one of several examples of glass of the time acquired by the Museum in 1844-45, probably with a view to representing modern manufacturing techniques in the collections. German stained glass seems to have enjoyed some popularity in early Victorian Britain, since people were often dissatisfied with the work of English companies during this period. Panel of clear and coloured glass with painted and stained details. The Virgin Mary is wearing a red and gold damasked gown, over which is a long cream-coloured cloak. She is seated as if in the middle of a branch of golden-coloured foliage. She has long blond hair and wears a gold crown with pearl-like inserts. Her head is framed by a golden halo. On her right leg she is balancing the Christ Child who is naked underneath what appears to be a long-sleeved cream-coloured christening gown, fastened at the neck. The Virgin holds his left hand with her left hand. The Christ Child has blond hair and his head is also framed with a golden halo. He is holding a golden ring in his out-stretched right hand. The background is blue glass with floral patterns picked out from the brown/black overpaint. There is a red flower in the centre of the right hand side of the panel. Copied from a panel in the Volckamer Window in the church of St Laurence in Nuremberg, a Strasbourg work of about 1480. The companion piece, on display in the British Galleries, shows St Catherine (Museum no. 2634-1855). The two panels together represent The Mystic Marriage of St Catherine. 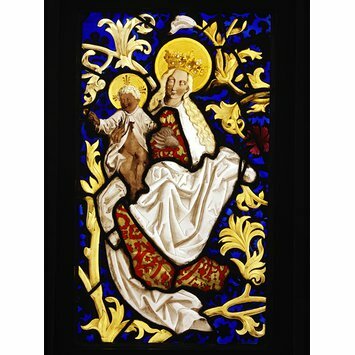 Panel of clear and coloured glass with painted and stained details depicting the Virgin and Child. Made by Stephen Kellner in Nuremberg, German, about 1845. Copied from a panel in the Volckamer Window in the church of St Laurence in Nuremberg.